Power grids were not designed to fail completely and be started-up all at once. The basic problem is that it takes energy to produce energy. Hydroelectric, steam and nuclear power plants all require energy to start up. Steam and nuclear plants require enough energy to bring a large amount of water to steam before operation can begin. Hydroelectric plants need power to open massive valves which opened manually normally take 300 turns. Hydroelectric plants are the easiest to start from black-out conditions. However, during the black-out of the HydroQuebec power grid in March 1989, it took 9 hours to restore 90% of the system even though it is based on hydroelectric power plants. Other types of plants might take days to restart. Large transformers are very expensive pieces of equipment (~$10 million). 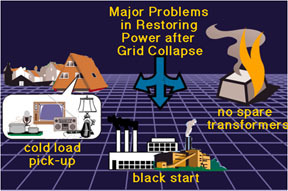 Since catastrophic transformer failures are extremely infrequent, power plants do not keep spare units. Lead times for ordering and delivery of new units can be quite significant (up to a year). While waiting for a new transformer, a power plant would be inoperable. Whenever an electrical device is started up, it requires an instantaneous surge of power that is greater than the normal operating power requirements for the device. For example, a flourescent light requires an instantaneous power surge 10 times greater than its normal operating requirements to start up. During normal operations of a power grid, the appliances in everyone's homes don't start up all at once but start ups are scattered randomly in time. After a black-out, every furnace or air conditioner, and a large number of other appliances will try to start up all at once. The power demand at start up is much larger than the normal power demands on the power distribution network.